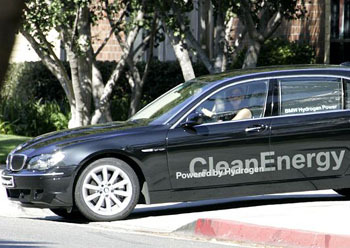 Jennifer Garner has been added to a long list of invite-only celebrities cruising around in a BMW Hydrogen 7. The list already includes Jay Leno, Edward Norton, and Will Ferrell, so the question begs as to who will be next to join this elite little group? The Hydrogen 7 which has recently has its tailpipe emissions certified, yes we know, its just water, but water that actually has been certified for human consumption! Okay, so were not suggesting that you shuffle up to the nearest Hydrogen 7 for a drink on a hot day, but it sure shows how clean the emissions are, probably better quality than what comes out of a whole lot of taps.